Description: Tragic circumstances surprisingly changed, a desperate cry for help heard and answered, a nagging need met--how can such things happen? 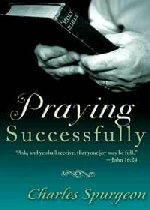 Through the powerful resource of prayer. As you read these pages, you will understand how to turn adversity into advantage, get ahead without competing, see your desires fulfilled, obtain the wealth available to you, find peace in life's storms, be free from sin, and receive the free gift of salvation. Begin to receive whatever you need from the Lord today. The blessings of God are yours for the asking!